We haven't been on a date in a long while so on Friday we decided to fix that :) We dressed real purdy and headed out to have dinner at Reality Bites. After dinner we were feeling pretty lazy so we just stopped by Red Box and picked up a movie. 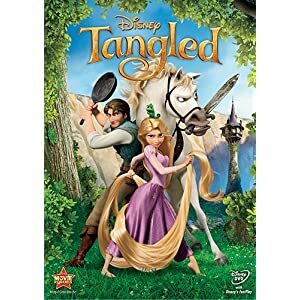 We decided to get Tangled because the Production Design is by Douglas Rogers, Kevin's cousin. Last year when we were in Vegas we happened to stop by Planet Hollywood and they happened to have a Cello that Douglas designed for a Disney charity auction on display. It was so cool and random to be able to see it in person! Such a fun memory and happy coincidence!